Macedonian Publisher Claims Success for Hitler's "Mein Kampf"
A Macedonian publisher claims to have sold thousands of copies of Adolf Hitler’s Mein Kampf, sparking debate about whether the fascist dictator’s book should be widely available in the country. 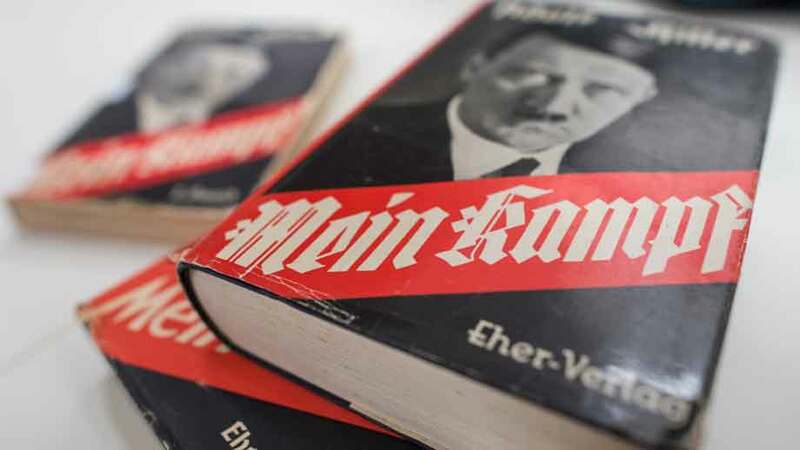 Adolf Hitler’s Mein Kampf caused a stir in Macedonia when photos of piles of copies of the Nazi leader’s book - on display at a publishing company’s stand at the Skopje Book Fair from May 3-9 - were posted online, sparking largely negative reactions. But Hitler’s autobiography can also be found on the shelves of Macedonian supermarkets, selling for about 300 denars (about five euros). Thousands of copies have been sold since the first Macedonian edition was published in 2005, claimed Nikola Kosteski, the founder of publishing house Gjurgja, which issued the translation. “The first edition is from 2005 and was printed in 1,000 copies. As it was being sold, new ones were printed. In 2011 we published it in two volumes, just like the original. Both were in 1,000 copies and were also sold, so we printed more,” Kosteski said. “I have no record of every copy sold, but it is still one of the most requested books,” he added. The Macedonian edition’s preface explains how Mein Kampf was written and published, how many copies were sold before and after Hitler came to power, and how it was published in other countries. It also cites the opinions of critics who say that it is an extremely poorly-written work which, according to a quote from British professor Donald Cameron Watt, spreads deadly ideas. However Watt also suggests that people should not be afraid of the book and should approach it objectively. “Of course we disagree with Hitler, and in the book’s preface we give negative opinions about it. But apart from that, there is no reason not to publish it,” Kosteski argued. Gjurgja has also published a collection of Nazi propaganda minister Joseph Goebbels’ speeches and a book about Mussolini. There is no evidence that the apparent commercial success of the Hitler edition has inspired a groundswell of Nazi support in Macedonia, experts say. There have been incidents of fascist graffiti being sprayed, but the radical right in Macedonia mainly concentrates on domestic issues such as the ‘name’ dispute with Greece and ethnic relations with the country’s large Albanian minority. Sociologist Gorgi Tonovski said he believes that the popularity of Mein Kampf in Macedonia is more due to curiosity than any ideological connection. “Tales about Hitler and about a book that was forbidden for a long time have done their job,” Tonovski said. But he argued that the book should not be as widely available as it is. “Certainly it should be available for historical and other research, but such books should be kept away from young people,” he said. However he also suggested that there is not a major risk that the book will become influential again because it was written for completely different times and historical conditions. Historian Kosta Adzievski also said that he believes that the book is still potentially dangerous. “Personally, I have not read it, nor do I intend to do so, because I think it’s a book that should not be read,” Adzievski said. “Only with new ideas we can go forward, we should not return to the old ones,” he added.